First of all, NO WAY! Did that really happen!!??? That sounds like something that would happen to me! ACK!!!! What a mess! Then of course... great minds think alike! 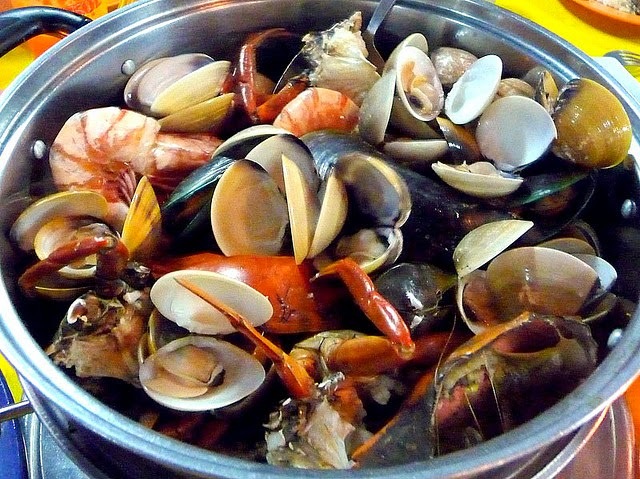 Steamed seafood... mussels, clams... add garlic, olive oil... some spice... broth..... yummmmmm! Yes, Katherine, the olive oil fiasco really happened, and it was a mess. I think my shoes have recovered. Yes, seafood is wonderful...all kinds! That always stinks when you find a place with amazing food, a dish you love and then ... they close. Been there before, too. Ugh! We have experienced that a number of times, both locally and in our travels. I was really excited to learn that they were reopening, but it wasn't the same and the new location did not have the same atmosphere. Yeah, me too. The mess was totally my fault, but I was still a bit steamed - at myself for not realizing it could fall through. Fortunately the shoes survived.